Arnold dispatched Keirn to England in August. He returned two months later with the plans for the Whittle W2B (an improvement of the original model), and an actual engine, the W1X. In addition to the plans and the engine itself, Keirn arranged to bring, to the United States one of Whittle's engineers and several technicians. Frank Whittle himself, the new engine's designer, visited the project during the time of intense development at General Electric's Supercharger Division at West Lynn, Mass. So new was the concept of a compressor-turbine combination propelling an airplane that, even with the plans and the reassembled engine, the supercharger experts remained skeptical. The British engineer recalled that "until we pushed the button and showed this thing running, the Americans wouldn't believe it would work".4 The General Electric group  succeeded in translating the British specifications and produced, not without difficulty, an American copy of the Whittle engine. Colonel Edwin R. Page, Chief of the Power Plant Branch at Wright Field from 1926 to 1932, played an important role in encouraging Moss's work. Page calmly kept faith, despite what appeared to be an enormous waste of government funds, while turbines at General Electric exploded to the right and left of him.6 Because of his association with the development of General Electric's supercharger, the Army called on Colonel Page to nurture the relationship between General Electric and the fledgling NACA laboratory in Cleveland. He was appointed the laboratory's first Army liaison officer in May 1943. So secret was the development of the Whittle engine that only after the classification of the project was downgraded from "super-secret" to "secret" early in the summer of 1943 was Keirn allowed to inform the NACA of this important project-over two years after Arnold's visit to England. Keirn furnished the select group at the meeting in Sharp's office with a set of plans by General Electric for a jet Propulsion Static Test Laboratory, which was begun in July. Pinkel picked Kervork K. Nahigyan to head the new jet Propulsion Section. In September contractors had hastily completed an inconspicuous one-story building at the Cleveland laboratory. It was surrounded by a barbed wire fence at the edge of the airport's runway. A heavily guarded truck delivered the General Electric I-A for testing.7 The Static Test Laboratory consisted of spin pits lined with wood to protect workers from the dangers of blades flying off in all directions when engine compressors reached their limits during endurance testing. The secret work carried on in this modest structure, set apart from the carefully designed permanent laboratory buildings for the investigation of the piston engine-would, after the war, become the major effort of the entire laboratory. If the success of the Whittle engine was news to the group in Sharp's office, the jet propulsion concept was not. Pinkel and Nahigyan had assisted work at Langley on a jet propulsion device, inspired and directed by one of the NACAs outstanding aerodynamicists, Eastman Jacobs. The Army had unceremoniously canceled this project, the previous February. Before World War II, many experts throughout the world shared the assumption that better aircraft engines would result from small improvements of the components of the piston or reciprocating engine. Because the aircraft engine was an adaptation of the automobile engine, radical innovations were expected to appear first in the automobile engine. Roy Fedden, then an engineer for the Bristol Aeroplane Company, wrote in an article ironically titled, "Next Decade's Aero Engines Will Be Advanced But Not Radical published in the Transactions of the Society of Automotive Engineers in 1933: "I do not anticipate any radical changes in the type of four-cycle internal-combustion engine as used today. When the present form of gasoline engine is superceded by a radically different power unit, it seems logical that this development will  most probably be accepted first in the automotive field before it is introduced into aircraft".8 Fedden's prediction was wide of the mark, for it was precisely Whittle's independence from the automotive background of traditional power plant experts that enabled him to seek a new engine uniquely suited for flight. The architects of the turbojet revolution, however, did not inherit the evolutionary approach of automotive engineers. Whittle and Hans von Ohain (who developed a turbojet independently in Germany were able to look at aircraft propulsion with a freshness lacking among the engine experts in Europe and the United States. The positive qualities of flying the gas turbine made up for the deficiencies observed in stationary industrial turbines. Whittle wrote: "There seemed to be a curious tendency to take it for granted that the low efficiencies of turbines and compressors commonly cited were inevitable. I did not share the prevalent pessimism because I was convinced that big improvements in these efficiencies were possible, and, in the application of jet propulsion to aircraft, I realized that there were certain favorable factors not present in other applications".10 The first positive factor that he singled out was that low temperatures at high altitudes actually made the engine more efficient. More energy was available to power the airplane. Second, Whittle thought the forward speed of the aircraft created a ram effect, which increased the efficiency of the compressor; third, only a portion of the energy released into the turbine had to be used to drive the compressor-the rest could be used for propulsive thrust. These were the criteria of an engineer-test pilot. Although Whittle also had a strong background in aerodynamics, it did not play a significant role in his early thinking. 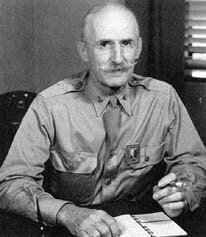 Arnold appointed Colonel Edwin R. Page to be the Army's liaison with the laboratory in 1943 because of his expertise in turbo-supercharger development. .....any body through the air depends on Newton's third law: for every action there is an equal and opposite reaction. In airplanes powered by a reciprocating engine, the propeller creates a jet of air that rushes backward to drive the aircraft forward. In a jet engine, however, the air is funneled into the engine, compressed, and heated. The air stream has reached a high velocity by the time it is ducted out the back end. Jet propulsion devices were conceived as early as c. 150 B.C. when Hero of Alexandria designed an aeolipile that produced jets of hot steam to rotate a spherical ball. In the late 18th century a British inventor patented the first gas turbine design, and by the early 20th century, through the innovations of Charles Parsons and others, industrial steam turbines were in general use for power generation. However, until the early 1930s few dreamed that the heavy turbines then in industrial use could be made light enough to be flown. Between the concept of a gas turbine and a successful aircraft engine flies the pitted terrain of development. Successful development involves a combination of technical ingenuity and determination on the part of the inventor. A less tangible factor, the role of scientific theory in invention, is more difficult to determine.12 In the case of the turbojet, the theoretical understanding of the science of fluid mechanics was far ahead of the ability to design practical machines. Although American and German theorists had directed attention to an understanding of the aerodynamics of both axial and centrifugal superchargers for aircraft, there is little evidence that this understanding played a direct role in the development of the turbojet. This suggestion may have encouraged Eastman Jacobs to take up the problem of thrust augmenters in 1926. Although this work had no practical application at the time, "this study stiffed in Jacobs the beginnings of a strong interest in high-speed aerodynamics".14 As early as 1935, at the Fifth Volta Congress in Rome, Italy, the world's leading aerodynamicists, gave serious consideration for the first time to the theoretical feasibility of flight at speeds at or faster than the speed of sound. A German aerodynamicist, Adolf Busemann, suggested in his Volta paper that a sweptback wing could solve some of the compressibility problems that aircraft would encounter at extremely high speeds.15 However, in the 1930s aerodynamicists and propulsion experts did not see how their fields complemented each other. Although theoretically it seemed possible to fly faster than the speed of sound, a propeller-driven aircraft could never reach the necessary speeds. The engine manufacturers were oblivious to the implications of the high-speed conference. According to von Ohain, "it should have scared the hell out of them... because that showed that the airplane, sooner or later, could easily break the supersonic barrier".16 That would render the piston engine obsolete. However, contrary to Edward W. Constant's thesis in The Origins of the Turbojet Revolution, Whittle and von Ohain revolutionized aircraft propulsion, not because of a knowledge of aerodynamics superior to that of American engineers, but through their insight that the  combination of compressor and turbine was uniquely suited as a power plant for flight. 17 Although the potential problem of compressibility as propeller tip speeds neared the speed of sound should have influenced Whittle and von Ohain, there is little evidence that this relatively unstudied phenomenon in the 1930s was a factor in their decision to look for a radically new type of power plant for aircraft. Rather, it appears that both were drawn to the turbojet because of its simplicity and potential as a power plant specially adapted to aircraft. It was their independence from the automotive-aircraft engineering tradition that enabled them to think outside the paths of accepted practice. When they began their work, the aircraft reciprocating engine had become a mind-boggling example of mechanical complexity. To attain higher speeds, designers added cylinders to increase power. To compensate for the decreased density of the air at higher altitudes that reduced power, they added superchargers. With added cylinders and superchargers, cooling became a problem solved by the addition of yet another component, the intercooler. In contrast to the difficult to maintain array of components and subcomponents, the turbojet offered the possibility of a light-weight engine of extraordinary simplicity. The engine, as conceived by Whittle and von Ohain, potentially could perform better at the higher altitudes that caused problems for the reciprocating engine, and its efficiency was likely to increase with speed. Like Whittle, von Ohain started with the idea that flight required a power plant specially adapted to motion through the air. His enthusiasm stemmed from the insight that an engine that burned continuously was "inherently more powerful, smoother, lighter and more compatible with the aero-vehicle" than the clumsy four-stroke cycle of a piston engine. His first idea was to "accomplish this process without employing moving machinery by bringing the inflowing fresh air in direct contact with the expanding combustion gas," a kind of ram jet.18 However, he soon realized that in order to get an efficient engine he needed to separate the two phases of compression and expansion. He finally arrived at a turbojet configuration similar to that of Whittle, whose 1930 patent he did not discover until after the development of his own design.19 Von Ohain's engine powered the first flight of a turbojet plane in August 1939 from the Marienehe Airfield in Germany. Although the turbojet created a revolution in aircraft propulsion,, it was not as radical a break with the technology of the reciprocating engine as the word revolution might imply. The technology of the supercharger, a component added to the reciprocating engine, provided the continuity between the old technology and the new. The supercharger was, in fact, a compressor. However, in the turbojet, the compressor took its place as an intrinsic part of the engine system. For the inventors, the choice of the compressor was significant, and it was not by chance that both Whittle and von Ohain chose a centrifugal compressor; the centrifugal supercharger was in common use in conventional engines. In contrast, axial superchargers were extremely demanding experimental devices. Both von Ohain and Whittle knew that the centrifugal compressor was a "brute force device" and that eventually they would "go, axial," but they started with the centrifugal compressor because it was simpler to build.20 In the same year that von Ohain demonstrated the feasibility of the turbojet concept, Anselm Franz, Germany's expert on super-chargers, designed the first turbojet with an axial-flow compressor. The new Special Committee had a broad responsibility to investigate all aspects of jet propulsion. Even members of the NACA would be asked to serve only in an ex officio capacity: "The backbone of the committee should be men of independent background and with them should be joined men of special capabilities in the process of evaluation".28 Pratt & Whitney, Wright Aeronautical, and Allison, the major manufacturers of piston engines, were deliberately excluded from participation on the committee, despite the interest that each company had shown in early jet propulsion schemes. For example, Pratt & Whitney had supported the development of a design by Andrew Kahtinsky of the Massachusetts Institute of Technology and by December 1941 had learned of the successful flight of Whittle's engine from a friend of the pilot "who flew the British straight propulsion machine".29 Wright Aeronautical may have learned of the Whittle engine during Tizard's visit and attempted in 1941 to negotiate for the American license from Whittle's Company, Power jets, Ltd.
William F Durand, chairman of the NACA's Special Committee on jet Propulsion. ....important, the selection of steam turbine manufacturers influenced the choice of the axial-flow compressor with multiple stages, a compressor used in industrial steam turbines. If the engine companies had been included, they would have been more likely to favor a design with a centrifugal compressor because of their experience with superchargers. In hindsight, it would have been wise to include at least one design based on the centrifugal compressor. 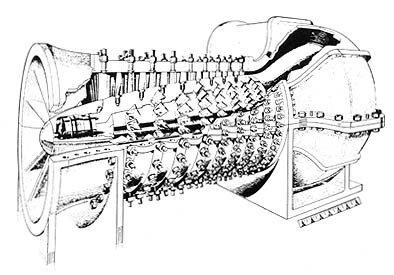 Jacobs's scheme for a ducted fan, nicknamed "Jake's jeep" by his NACA colleagues, was among several embryonic efforts to develop a gas turbine power plant for aircraft in the United States prior to the importation of the Whittle engine.32 Jacobs received the high-level support of Bush and Durand. As a result of his prestige, the designs that the industry representatives on the Durand Committee later developed owed a great deal to preliminary studies made at Langley. Jacobs was riding a crest of prestige for the development of NACA laminar-flow airfoils. His reputation as an aerodynamicist made the NACA effort more credible than other proposals. About 1931 the Italian Secondo Campini had first conceived a ducted-fan engine design, and Jacobs may have learned of this scheme when he attended the Volta Congress in Rome in 1935. The ducted fan, a hybrid scheme consisting of a conventional piston engine and compressor, lacked the simplicity of the turbojet. Air entered a long cylindrical nacelle through a duct, where it was compressed. The section of the nacelle in back of the compressor served as a combustion chamber. Fuel was injected into the chamber and ignited. The heated gases, directed out the back through a high-speed nozzle, produced thrust to drive the engine forward. The Campini engine had a two-stage centrifugal compressor; Jacobs modified Campini's design. He chose an axial compressor with two stages. Jacobs had problems not only with the compressor, but also with the combustor, which failed to function properly. 33 Nevertheless, in the view of Clinton E. Brown, who worked on the project, the jeep was a sound idea. Jacobs proved the feasibility of his ducted fan concept.34 However, compared to Whittle's far simpler design for a turbojet, its development in 1941 was embryonic. At the April 22 meeting, members of the Special Committee also heard summaries of British reports on the development of axial-flow compressors, probably those of A. A. Griffith and Hayne Constant of the Royal Aircraft Establishment, who had been working for many years, with limited success, on axial compressors. Their goal was a gas turbine engine to drive the aircraft's propellers. What the Special Committee could not know was that Whittle had chosen not to use the more complicated axial configuration for his turbojet engine. By the May 8 meeting, Arnold had returned to the United States, and the Special Committee expected to be briefed on the latest developments. Instead, because of the British imposition of a "most secret" classification on the project, the committee was merely asked to suggest the names of two engineers to be sent to England to "make contact" with British developments in jet propulsion. Durand, betraying his mistaken belief that the new British propulsion system used the axial compressor, suggested D.R. Shoults of General Electric, "an expert in matters relating to axial-turbo compressors, which type of equipment forms the core of the British development.36 At the same meeting, Lewis, sharing the same prejudice in favor of the axial-flow compressor, referred to the eight-stage compressor developed by Eastman Jacobs and Eugene Wasielewski intended primarily as a supercharger. He revealed that General Electric "was interested in developing this compressor to its full capacity since the Committee's tests had been limited to low speeds and the use of only six of the eight stages which had been provided." At this point, all the signs indicated that an axial compressor would be a significant component of any jet propulsion scheme, a presumption shaped by the influence of Jacobs and the knowledge of the publications of the British aerodynamicists, Griffith and Constant. Future engineering practice would vindicate this decision, since the axial compressor did eventually prevail over the centrifugal. 37 For short-term wartime needs, however, Jacobs underestimated the axial-compressor's recalcitrant problems. The NACA would pay dearly in terms of lowered prestige for its early commitment to axial compressor development and its failure to recognize the definite advantage of the compressor-turbine combination embodied in Whittle's turbojet. In early June Arnold sent a brief but significant memorandum to Bush. It contained as attachments a picture of the Whittle engine and a short description that had been sent by diplomatic pouch from Lieutenant Colonel J. T. C. Moore-Brabizon of the Ministry of Aircraft Production. Item one of the description stated: "The Whittle jet propulsion engine consists of 10 combustion chambers (equivalent to the cylinders of a normal engine), an exhaust gas turbine, a supercharger, and an exhaust jet or nozzle".38 Notably absent from the description was a key element. Was the "supercharger" (i.e., the compressor) axial or centrifugal? The NACA eight-stage axial-flow compressor designed by Eastman Jacobs and Eugene Wasielewski. By July Arnold had selected General Electric to copy the Whittle engine. D. Roy Shoults, then in England to oversee the British use of General Electric's turbo supercharger, became General Electric's representative, assisted by Alfred J. Lyon, the Army's technical liaison officer in Great Britain. In August Colonel Donald Keirn, the engineer from Wright Field who brought the news to the Cleveland laboratory two years later, took off for England to bring back the Whittle engine. Later Keirn joined the Special Committee so that he was fully informed of all the jet propulsion projects, both the "most secret" Whittle project and the "secret" projects of the Special Committee. While Bush and Durand steadfastly supported the NACA project, from the time of his visit to England in April, Arnold had become a believer in the future of the Whittle engine. His letter to Colonel Lyon, 2 October 1941, reveals the first discussions of a possible future Army effort to preempt the jet propulsion field and thereby end the NACA hegemony over basic aeronautical research. However, with characteristic restraint, he refused to commit himself on this issue. Clearly, he saw the turbojet as a possible answer to the problem of obtaining higher speeds for pursuit aircraft, but he stopped short of predicting that the piston engine would be obsolete in ten years. The letter reveals Arnold's astute assessment of the possible dawning of a new era of jet propulsion. Although not privy to the full Whittle story, the Durand committee had enough information on the Whittle engine to see the potential of the compressor-turbine combination. The committee set up a Special Compressor-Turbine Panel, chaired by R. C. Allen, manager of the Allis-Chalmers Steam-Turbine Department. It should be noted that Jacobs and his team were obviously informed of the conclusion of the panel, but persisted in their belief that the hybrid scheme would work. A letter to the panel from Henry Reid, Engineer-n-Charge at Langley, indicated that "jet propulsion can better be accomplished at present with the use of the conventional engine".43 Reid conceded that a more radical approach to aircraft propulsion might prevail in the long run. Although they had at last hit upon the compressor-turbine combination, the panel considered only the axial-flow compressor. Whether the simpler centrifugal compressor was considered at all is difficult to determine, since all the minutes for the compressor-turbine panel have not been found. The axial compressor, because of its smaller frontal area and higher potential pressure ratio, looked more promising on paper. However, if the axial compressor was lighter and more compact, it demanded knowledge of aerodynamics. The complex movement of air across the blades of several stages presented a challenge to the designer. The fabrication of the complicated compressor was a nightmare. Vibrations created the danger that compressor blades might fly off in all directions. The simpler solution found by Whittle and von Ohain-the centrifugal compressor-eluded the steam turbine experts on the committee. When the Durand Committee met at Langley Field in September, they recommended that Jacobs begin design studies to explore "the most suitable means for applying this system of jet propulsion to actual aircraft". They also decided that the preliminary studies of the companies could be made into actual proposals for submission to the Army or Navy.46 The Navy approved designs for a turbojet by Westinghouse and for a type of ducted fan by Allis-Chalmers. The Army agreed to support General Electric's proposal for a turboprop. If the committee had encouraged at least one American design based on the centrifugal compressor, more rapid progress would have been apparent. Kept in the dark, those making the initial decisions did not know that part of the success of the Whittle engine depended on its simple centrifugal compressor. Progress on all four of the projects of Durand's Special Committee was slow. In June 1942, Vannevar Bush raised doubts about the wisdom of exclusive reliance on the axial compressor. Referring to "the secret development being carried on by the General Electric Company on compressors for use in jet propulsion," he wanted to know whether the special panel that "had previously provided for the interchange of information on compressor design" should be reconvened. Durand responded that A. R. Stevenson, Jr., General Electric's representative on the committee 'had expressed the view that the time had passed for such an interchange of views".49 In November Stevenson reassured the committee that, although it was behind schedule, their "troubles" were routine. These "troubles" were directly related to the compressor: "We are becoming quite worried about vibration of the blades on the axial-flow compressor". He reported that their experimental four-stage compressor, like the one at Langley, had lost its blades. "We believe it was due to fatigue caused by pulsating air force. "50 General Electric's turboprop, the TG-100/T31, reached the test stand by 1943. Although a turboprop provides more efficient propulsion at modest speeds, the gearing to connect the gas turbine to the propeller adds mechanical complexity. The simplicity of the turbojet probably induced General Electric engineers to design the succeeding model, the TG-180/J35, as a turbojet. Nevertheless, its tricky axial compressor made significant progress slow. Support for the Allis-Chalmers design for a ducted fan with double paths of cool and hot air was dropped by the Navy in 1943, when the company obtained the license to build a British Havilland-Halford jet propulsion unit. Jacobs never had the benefit of the British solution to the combustion problem. Unaware that turbojets had already passed their bench tests in England and Germany, Langley engineers struggled to perfect Jacobs's hybrid scheme. The problem of achieving stable combustion in a continuous airstream without creating a flame that was so hot it would melt the metal sides of the apparatus was particularly recalcitrant. Jacobs tried to get the fuel to vaporize within a tubular boiler. However, he could not get his system to operate satisfactorily, and he agreed to enlist the assistance of Kemper's Power Plants Division. The "burner" problem was turned over to Ben Pinkel's Engine Analysis Section. Durand strongly supported the idea that a series of fuel jets should be tried. Pinkel assigned Kervork Nahigyan the task of redesigning the burner. Durand noted on a visit to Langley in March 1942 that both Jacobs's approach and that of the Power Plants Division appeared promising. He encouraged the rivalry between the two groups and set a deadline for an actual demonstration to the entire committee for July 15.53 The demonstration, featuring Jacobs's solution, looked promising enough for the committee to encourage the work to be continued. Schematic view of General Electric's TG-180 shows the axial compressor influenced by the NACA eight-stage compressor. ....however, felt a little anxious about Jacobs's work, due to the fact that the Committee is directly interested in that particular project in the sense that its success or failure will react directly on the reputation of the Committee-at least in connection with this particular work. "54 Two General Electric 1-A engines powered the Bell Airacomet (P-59A) into the sky several days later. Durand informed members of the Special Committee that "resulting from entirely different causes" a meeting had been called "on the initiative of Army aviation" to take place in Washington, D.C., on November 13. Although no direct reference was made to the Whittle project, there could have been no question in any member's mind as to what Durand was talking about when he wrote that representatives of the Army, Navy, the Chairman of NACA, and the Chairman of the Special Committee on jet Propulsion "take a broad general view, with an attempt to evaluate its significance as a factor in our present war effort, and, if possible, to reach some decision as to the extent to which the subject merits immediate support and development". He revealed that a report on the Langley project would be presented at that time.56 Thus, the committee was placed for the first time in a position to judge the relative merits of the two systems, Jacobs's ducted fan and Whittle's turbojet. Obviously, the Whittle turbojet was the winner because it was at a point of development well beyond that of the NACA project. Although it was not clear at the time, ultimately the complexity and the excessive amount of weight in comparison to its low thrust meant that the ducted fan could not compete with the simplicity, efficiency, and low maintenance of future turbojets. The jeep, nevertheless, played an important role in future American turbojet development because it stimulated both axial-compressor research and pioneering work on afterburners work that was continued after the move of the Power Plants Division to Cleveland. Even after the Army's decision, Jacobs continued to believe in his ducted-fan design. In January 1943, after his transfer to Cleveland, Nahigyan perfected his design for a burner employing a series of liquid-injection spray nozzles, located within bell-shaped flame holders.58 This experience made him the natural choice to head the jet Propulsion Section when Keirn brought the plans for the Static Test Laboratory from General Electric. A technician uses a micrometer to determine possible distortion of the turbine blades of General Electric's I-40 turbojet engine. 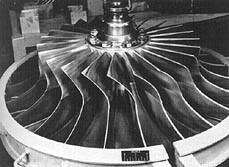 The ring of combustor cans, immediately behind the turbine, was Whittle's solution to the combustion problem. Viewed in the context of the abortive effort to develop the jeep at Langley, Arnold's decision to assign the Cleveland laboratory the task of solving the mechanical problems of existing piston engines takes on new meaning. He had lost confidence in the NACAs technical leadership in the propulsion field. The cancellation of the jeep took the creative, experimental work on jet propulsion away from the NACA for the duration of the war. Arnold chose to promote General Electric, a company previously only marginally involved in the development of aircraft engines, to a place on the cutting edge of jet propulsion development in the United States. Although the piston engine companies bore the brunt of Arnold's wrath for the dismal engine situation, he also punished the NACA for its belated and rather minimal efforts prior to 1941 to develop a jet propulsion scheme. When Colonel Donald Keirn unveiled the plans for a jet Propulsion Static Test Laboratory for the Cleveland laboratory, the Army again assigned a role in the development of jet propulsion to the NACA. This visit, however, clearly underscored the Army's intention to limit this involvement to the testing of engines already developed by private companies such as General Electric and Westinghouse. Jacobs's jeep briefly gave the NACA license to develop a jet prototype. The Cleveland laboratory would continue to feel the repercussions of its cancellation. By August 1943 it was clear to the leaders of the Cleveland laboratory that jet propulsion would play an increasingly important role in the future. After a survey of existing facilities, George Lewis pointed out that "when the Committee's Cleveland laboratory was laid out, no thought was given to the provision of facilities for testing jet propulsion units".63 This omission revealed an astounding lack of vision. Secret jet propulsion tests of General Electric's I-16 were carried out in the Static Test Jet Propulsion Laboratory, completed in September 1943. By March 1944 Lewis reported on the "change in character of the Committee's research program" brought about by the "success of the Whittle jet-propulsion engine". Staff working under Kervork Nahigyan in the special jet Propulsion Static Test Laboratory built and tested the first afterburner in October 1943, a direct result of the earlier work on the burner for Jake's jeep. Abe Silverstein's group adapted the Altitude Wind Tunnel to test the new jet propulsion units. General Electric and Westinghouse sent experimental models of their engines for tests in the new tunnel. Although denied work on their own experimental engine of NACA design, the staff of the Cleveland laboratory acquired a unique, hands on, experience in jet technology. They would build on this early experience to become the government's experts in jet propulsion in the early postwar years. 1. Letter from Ben Pinkel to V. Dawson, 2 September 1984. 2. Trip to England, 9 April-1 May 1941, Container 271, H. H. Arnold Papers, Manuscript Division, Library of Congress. Lord Beaverbrook's full name was William Maxwell Aitken Lord Beaverbrook. 3. The best primary source for the history of the General Electric Whittle project is "Case History of Whittle Engine," Historical Study no. 93, Air Force Logistical Command History Office, Wright Patterson Air Force Base. This consists of Army correspondence and contains a wealth of information waiting to be mined. General Electric's company history, Seven Decades of Progress (Fallbrook, Calif.: Aero Publishers, Inc., 1979) is somewhat disappointing. An unpublished study by William Travers, The General Electric Aircraft Engine Story, is more detailed. General Electric Company papers from the West Lynn plant have recently been acquired by the National Air and Space Museum. "Jet Propulsion Engine Technical Data," Colonel Donald Keirn's Personal Data, Book, 1945, Part 1, Air Force Central Museum, Dayton, Ohio, includes the performances of all of the American turbojet projects. 5. 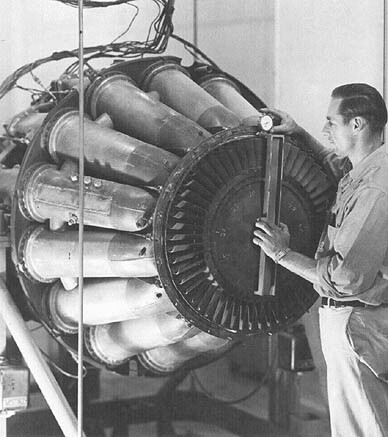 On turbosupercharger development, see Robert Schlaifer, Development of Aircraft Engines (Boston: Graduate School of Business Administration, Harvard University, 1950),p. 328-329. Also, Leslie E. Neville and Nathaniel F. Silsbee, jet Propulsion Progress: The Development of Aircraft Gas Turbines (New York: McGraw Hill, 1948), p. 98-102. 6. Ben Pinkel, "Smoker Talk to AERL Staff," History looseleaf, NASA Lewis Records. 7. Ben Pinkel to V. Dawson, 2 September 1984. 8. A. H. R. Fedden, "Next Decade's Aero Engines Will Be Advanced But Not Radical." Transactions of the Society of Automotive Engineers 28(1933):379. 9. Oscar W. Schey, Benjamin Pinkel, and Herman H. Ellerbrock, Jr., "Correction of Temperatures of Air-Cooled Engine Cylinders for Variation in Engine and Cooling Conditions," Technical Report 645, NACA 1939 Annual Report. 10. Frank Whittle, "The Early History of the Whittle jet Propulsion Gas Turbine," Inst. Mech. Engr. Proceedings 152(1945):419. 11. In addition to studies mentioned in note 5, for the history of jet propulsion, see Edward W. Constant II, The Origins of the Turbojet Revolution (Baltimore: The Johns Hopkins University Press, 1980). See also G. Geoffrey Smith, Gas Turbines and Jet Propulsion (London: Iliffe & Sons, 1955), 6th ed., and Walter J. Boyne and Donald S. Lopez, The Jet Age: Forty Years of Jet Aviation (Washington, D.C.: National Air and Space Museum, 1979). 12. On the science-technology relationship, see Edwin Layton, "Mirror-Image Twins: The communities of science and technology in 19th-Century America." Technology and Culture 12:562-580. 13. Edgar Buckingham, "Jet Propulsion for Airplanes," Technical Report 159, NACA 1923 Annual Report, p. 75-90. Buckingham's scheme probably consisted of a compressor with afterburner, the compressor driven by a reciprocating gasoline engine. (Comments courtesy of Hans von Ohain, 5 June 1987.) See also Rexmond C. Cochrane, Measures for Progress: A History of the National Bureau of Standards (U.S. Department of Commerce, 1966), p. 282-283. 14. James Hansen, Engineer in Charge, NASA SP-4305, 1987, p. 225; and John Becker, The High-Speed Frontier, NASA SP-445 Washington, D.C.: US. Government Printing Office, 1980), p. 30. 15. See Theodore von Karman's description of the conference in The Wind and Beyond (Boston: Little, Brown and Co., 1967), p. 216-218. 16. "Walker, An Encounter Between the jet Engine Inventors, Sir Rank Whittle and Dr Hans von Ohain, p. 28. 17. See Edward Constant's analysis, The Origins of the Turbojet Revolution, p. 15-18 and chapter 7. To an earlier draft of this chapter, Dr. Hans von Ohain responded by letter 5 June 1987: "I fully agree with you that the first success of jet engines was more a result of the simplicity of a radial jet engine with respect to structure, performance characteristics of the engine components and matching, rather than superior scientific insights in aerothermodynamics. (One could add that the radial engine also has inherently a favorable thrust to weight ratio, which is a necessary condition for high-speed flight.)" 18. Hans von Ohain, "The Evolution and Future of Aeropropulsion Systems," in Boyne and Lopez, The Jet Age, p. 29. 20. Interview with Hans von Ohain, 11 February 1985, at the National Air and Space Museum. 21. Bush to Arnold, 2 July 1941, 47/208, Papers of H. H. Arnold, Manuscript Division, Library of Congress. On the Tizard mission, see Daniel J. Kevies, The Physicists (New York: Vantage Books, 1979), p. 302-303. 22. Arnold to Bush, 25 February 1941, Records of NACA Committees and Subcommittees, National Archives, Record Group 255, 117.15. On the rocket work of the Guggenheim Aeronautical Laboratory, California Institute of Technology, see also Clayton Koppes, The JPL and the American Space Program (New Haven: Yale University Press, 1982). 23. Kevies, The Physicists, p. 296. 24. Bush to Arnold, 10 March 1941, Records of NACA Committees and Subcommittees, National Archives, Record Group 255, 117.15. 25. Towers to Bush, 17 March 1941, NACA Committees and Subcommittees, National Archives, Record Group 255, 117.15. 26. 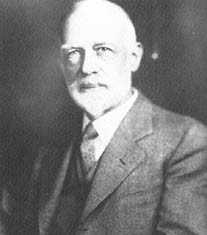 Frank B. Jewett, President of the National Academy of Science, on the occasion of Durand's 85th birthday, National Archives, Record Group 255, Durand biographical file. See also Walter G. Vincenti, "The Air-Propeller Tests of W. R Durand and E. R Lesley: A Case Study in Technological Methodology." Technology and Culture 20:712-751. 27. Bush to Durand, 18 March 1941, Records of Committees and Subcommittees, National Archives, Record Group 225, 117.15. 28. Ibid. This opinion was also shared by Towers. See Tower's letter to Bush, 17 March 1941, and Bush to Charles Abbot, 29 March 1941, National Archives, Record Group 225. The full committee consisted of Durand, Soderberg, R. C. Allen (Allis-Chalmers), L. W. Chubb (Westinghouse), A. G. Christie, Hugh L. Dryden, Brig. Gen. 0. P. Echols, Jerome Hunsaker (ex officio), Capt. S. M. Kraus, U.S.N., G. W. Lewis (ex officio), and A. R. Stevenson, Jr. (General Electric). 29. L. S. Hobbs to Jerome Hunsaker, 12 December 1941, NASA History Office, Washington, D.C., copied from J. C. Hunsaker Papers, Smithsonian Institution. See also Schlaifer, Development of Aircraft Engines, p. 453. 30. Minutes of Meeting of Special Committee on jet Propulsion, 10 April 1941, NASA History Office. My discussion relies on the minutes of the Special Committee April 10, 22, May 2, 8, 28 (July 25 missing); Compressor-Turbine Panel: July 25, September 22, 1941, February 3, 1942; Compressor-Turbine Panel, February 3, 1942, July 31, 1942, and December 1, 1942, located in the NASA History Office. Minutes of February 20, 1942, July 31, 1942, April 2, 1943, August 18, 1943, October 29, 1943 are in National Archives, Record Group 225. See also correspondence and Durand's reports in Records of NACA Committees and Subcommittees, National Archives, Record Group 225, 117.15. My account is supplemented by correspondence between Bush, Durand, and Arnold found in H. H. Arnold Papers, Manuscript Division, Library of Congress. For information on the Westinghouse project, I have also consulted the New Papers and the Westinghouse file, National Air and Space Musuem, Washington, D.C. Goddard's rocket work is compared to the far more practical work of the group at the California Institute of Technology by Clayton Koppes, JPL and the American Space Program New Haven: Yale University Press, 1982), chapter 1. 31. Bush to Durand, 18 March 1941, Records of Committees and Subcommittees, National Archives, Record Group 225, 117.15. 32. James Hansen has shed new light on the NACA project at Langley in Engineer in Charge, chapter 8. Hansen's account relies on extensive documents in the Langley archives. See also Brian J. Nichelson, "Early jet Engines and the Transition from Centrifugal to Axial Compressors: A Case Study in Technological Change," Ph.D. Dissertation, University of Minnesota, 1988. The work of the Durand committee is discussed briefly in Schlaifer, The Development of Aircraft Engines, p. 457-460. The Jacobs project received only a passing reference in George Gray's Frontiers of Flight (New York: Alfred A. Knopf, 1948), p. 278, a work commissioned by the NACA. For a reliable account of early jet propulsion work in Europe and the United States, see Leslie E. Neville and Nathaniel F Silsbee, jet Propulsion Progress (New York: McGraw-Hill, 1948). Jacobs enlisted the aid of Eugene Wasielewski (a member of the Supercharger Section of the Power Plant Division) in the design of the compressor, and it proved to provide good performance. They built a vaporizing type burner for this system on the assumption that vaporization of the fuel was required to achieve efficient combustion. Jacobs could not get the burner to function properly. The "jeep," as this system was called, was turned over to the Engine Analysis Section for further development and testing. I assigned K. K. (Nick) Nahigyan the task of designing the burner. He employed about 40 spray type liquid injection nozzles each located at the apex of individual bell-shaped shells. The bells were oriented with their open ends down-stream and served as flame holders. The engine cycle consisted of the following steps. Air entered the front of the nacelle, was compressed by the engine-driven compressor, then passed into the combustion chamber where fuel was injected and ignited and finally, the products were discharged through the variable area nozzle. 34. Clinton E. Brown to V. Dawson, 11 September 1989. On the ducted fan, see James Hansen, Engineer in Charge, p. 222. See also Jonathan W. Thompson, Italian Civil and Military Aircraft 1930-1945 (Fallbrook, Calif.: Aero Publishing, 1963), p. 95-96. 35. Macon C. Ellis, Jr., and Clinton E. Brown, "NACA Investigation of a Jet-Propulsion System Applicable to Flight." Technical Report 802, NACA 1943 Annual Report, p. 491-501. This is the only published NACA report on the jeep. 36. Durand to Arnold, 9 May 1941, 43/102, Manuscript Division, Library of Congress. The work of Hayne Constant and A. A. Griffith led to an agreement in 1937 between the Royal Aircraft Establishment and Metropolitan Vickers Company to design an engine with an axial compressor. This engine was flight tested 13 November 1943. For further information on the development of British turbojet engines, see Harold Roxbee Cox, "The Beginnings of jet Propulsion." The Royal Society of Arts Journal, September 1985, p. 705-723. 37. Minutes of the Special Committee on jet Propulsion, 8 May 1941, p. 4, NASA History Office. The report on Jacobs's compressor work was published after he left Langley by John T. Sinnette, Jr., Oscar W. Schey, and J. Austin King, "Performance of NACA Eight-Stage Axial-Flow Compressor Designed on the Basis of Airfoil Theory," Technical Report 758, NACA 1943 Annual Report. For a case study of early axial-compressor development, see Brian J. Nichelson, "Early jet Engines and the Transition from Centrifugal to Axial Compressors: A Case Study in Technological Change," Ph.D. Dissertation, University of Minnesota, 1988. 38. Arnold to Bush, 2 June 1941, Picture and description have no date and were separated from the memo routed from Bush to Durand and then returned. H. H. Arnold Papers, 47/208, Manuscript Division, Library of Congress. 39. Arnold to Bush, 25 June 1941, H. H. Arnold Papers, 44/124, Manuscript Division, Library of Congress. 40. Bush to Arnold, 2 July 1941, H. H. Arnold Papers, 47/208, Manuscript Division, Library of Congress. 41. Bush to Arnold, 11 July 1941, H. H. Arnold Papers, 471208, Manuscript Division, Library of Congress. 42 Arnold to Alfred J. Lyon, 2 October 1941, H. H. Arnold Papers, 43/102, Manuscript Division, Library of Congress. 43. Minutes of Meeting of Turbine Panel of jet Propulsion Committee, 25 July 1941, p. 2, NASA History Office. A company history of General Electric, Seven Decades of Progress (Fallbrook, Calif.: Aero Publishers, 1979), p. 41, says that by June all three companies were committed to the axial compressor. 44. Alan Howard, who worked on General Electric's turboprop, the TG-100, based his design for an axial-flow compressor on a 1934 NACA paper by O'Brien and Folsom, "the Design of Propeller Pumps and Fans." He gave the specifications based on data relating to airflow over a NACA airfoil to the Peerless Pump Company (now part of Food Machinery Corporation) "with the proviso that the pump be built exactly to the design calculations." Letter to the author from William Travers, 22 August 1985. However, a G.E. company history relates that Howard, Glenn Warren, and Bruce Buckland, who worked on the project, were convinced by tests of an axial compressor carried out in Cleveland, undoubtedly a reference to the eight-stage axial compressor, tested in Cleveland and used in the TG-180, a turbojet designed after the TG-100. See Seven Decades of Progress, p. 39. See also A. R. Stevenson to Durand, 27 November 1942, NACA Committees and Subcommittees, National Archives, Record Group 225, 117.15. 46. Minutes of the Executive Committee of the NACA, 24 October 1941, National Archives, Record Group 225, Box 8. 47. Durand to Echols, 27 February 1942, Records of NACA Committees and Subcommittees, National Archives, Record Group 225, 117.15. 48. "Case History of Whittle Engine," Historical Study no. 93, vol. I, document 24, AFLC History Office, Wright-Patterson Air Force Base, Dayton, Ohio. Classification of the Whittle project was downgraded from "supersecret" to "secret" in summer 1943. 49. Minutes of the Executive Committee of the NACA, 16 June 1942, National Archives, Record Group 225, Box 8. 50. A. R. Stevenson to Durand, 27 November 1942, NACA Committees and Subcommittees, National Archives, Record Group 225, 117.15. 51. For the development of the Westinghouse "Yankee" engine, see "The History of Westinghouse in the War," Aviation Gas Turbine Division, Engineering Department, Westinghouse, in the W, R. New Papers, Special Collections of Air and Space Museum, Washington, D.C., p. 20. Charles Edward Chapel, ed., Aircraft Power Plants ed, New York: McGraw-Hill, 1948), p. 353-363, See also Neville and Silsbee, Jet Propulsion Progress, p. 145-50; John Foster, Jr., "Design Analysis of Westinghouse 19-B Turbojet." Aviation, January 1946, p. 60-68; Robert B. Meyer, Jr. "Classic Turbine Engines," in Casting About (Howmet Turbine Components Corp. magazine, 1985), p, 12-15. 52. Neville and Silsbee, Seven Decades of Progress, p. 55. Arnold authorized discussion "of the Whittle matter" with Glenn Warren, one of G.E's designers at Schenectady. Arnold to D. R. Shoults, 27 August 1941, reproduced in Seven Decades of Progress, p. 45. 53. Durand's "Notes on Visit to Langley Field," 31 March 1942, and Minutes of Executive Committee of NACA, 16 June 1942, National Archives, Record Group 255, Box 8; Ben Pinkel to author, 26 October 1984. 54. Durand to Lewis, 29 September 1942, National Archives, Group Record 255, 117.15. 55. Durand to Stevenson, 16 October 1942; Durand to Keirn, 29 October 1942, National Archives, Record Group 255, 117.15. Hansen discusses the continuation of the Campini project, in Engineer in Charge, p. 238-247. 56. Durand to Members of Special Committee on jet Propulsion: Soderberg, Allen, Chubb, Christie, Dryden, Keirn, Kraus, Spangler, Stevenson, Taylor, 6 November 1942, Records of NACA Committees and Subcommittees, National Archives, Record Group 255, 117.15. 57. Letter to V. Dawson, 2 September 1984. Pinkel did not give the author an exact date. Arnold's letter to the NACA informing it of his decision to fight the war with the piston engine is dated 14 October 1942. It was reported in the Minutes of the Power Plants Committee, 11 December 1942, Records of NACA Committees and Subcommittees, National, Archives, Record Group 255, 112.02. This seems consistent with Pinkel's recollection that he heard of Arnold's decision prior to his departure for Cleveland. It is not entirely clear what tests on the jeep he is referring to here. 58. Pinkel to V. Dawson, 2 September 1984. A sketch of Nahigyan's design can be found in Records of NACA Committees and Subcommittees, National Archives, Record Group 255, 117.15. 59. Memorandum for files, "Visit to Wright Field to discuss NACA jet-propulsion airplane design," 20 January 1943, Jacobs file, National Archives, Record Group 255, Box 131, 23-25. 60. Minutes of Meeting of Special Committee on jet Propulsion, 2 April 1943, National Archives, Record Group 255, 117.15. 61. Roland, Model Research, p. 185. 62. Arnold to Craig, "Defense Against Enemy jet Propelled Aircraft," 24 May 1944, Papers of H. H. Arnold, Carton 43, file 102, Manuscript Division, Library of Congress. See also I. B. Holley, Jr., "Jet Lag in the Army Air Corps," Military Planning in the Twentieth Century, Proceedings of the Eleventh Military History Symposium, 10-12 October 1984, Office of Air Force History, p. 123-153. 63. Minutes of Meeting of Special Committee on jet Propulsion, 18 August 1943, National Archives, Record Group 255, 11. 64. Telephone conversation with Henry Meltzer, 17 September 1984. Meltzer later became head of the turbine blade section. Also interview with Rudy Beheim, 11 July 1984. 65. Report to the Executive Committee, 16 March 1944, NACA Executive Committee Minutes, National Archives, Record Group 255, Box 9.